Switch is the second book by Chip & Dan Heath, authors of my all time favourite book Made to Stick. Whereas Made to Stick (read my review here) was about making your messages stick into the minds of the audience, Switch is about change. How to change things when change is hard? reads the cover of the book. Switch, like Made to Stick, is full of real life examples and based on years of research. The main objective of the book is to help us carry out a change. This change can be in our own life (wanting to get up early and go to gym) or changing the behaviour of others (boss, subordinates, colleagues, family or your company). 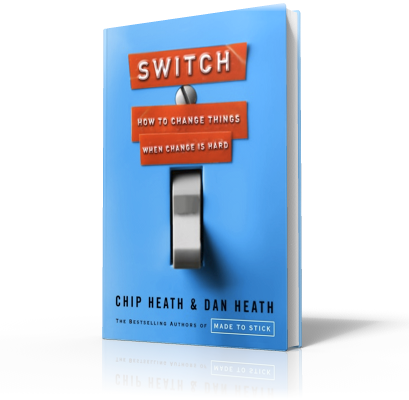 The authors Chip & Dan Heath propose a simple framework to help us make the change we desire. Before proposing this methodology they dispel the myth that people avoid change. It is often believed that we all resist change yet the authors give examples which prove that by nature we are not opposed to change (couples welcome what is perhaps the biggest change in their lives; their child). The authors also make the point that big changes do not require equally big actions. Often small actions can lead to major changes. This might sound weird but is actually easy to understand. This analogy has been used throughout the book and serves us well. When you make a change, you make someone change her behaviour. Which means you have to make her act differently. This can only happen when the her brain accepts to act in a different manner. 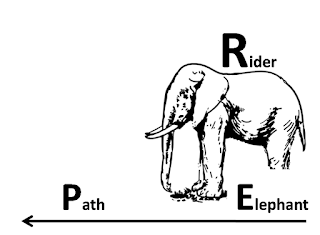 The brain has two sides; the emotional side (elephant) and the rational side (rider). Imagine a rider sitting atop an Elephant. Change is when the elephant and the rider move in the direction you want them to move. The Elephant is the emotional side. It wants instant gratification. It thinks short term. When you buy a chocolate or ice cream on impulse and eat, its your emotional side in action. When you snooze your alarm at 5.30am and dont get up, blame it to your Elephant. The rider is the rational side. It thinks long term. It analyses a problem and comes up with solutions. When you want to go on a diet from tomorrow, it is your rider in action. A change happens only when the rider and the elephant move in the same direction. Shaping the path means making the change easy to happen. If you recommend a healthy lifestyle to your kids you are making a generic statement. What is a healthy lifestyle? There are a thousand ways to become healthy? So the rider of the kids is confused. Instead if you ask your kids to go to gym everyday and workout for 30 minutes you are giving a very clear direction and making it easier for kids to implement the change. That's what is called shaping the path. 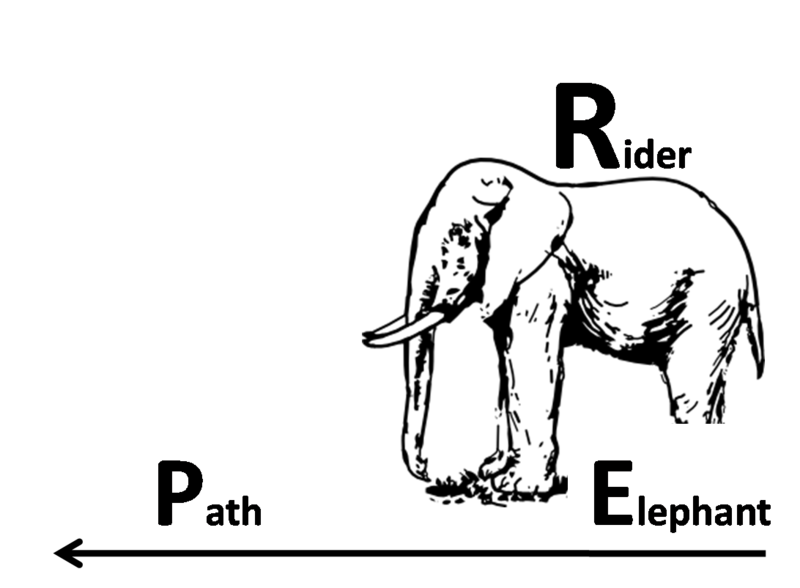 The book goes on to explain how to direct the rider (tell the rider where to go), motivate the elephant (so that it does not oppose the rider) and shape the path so that a change can take place. The book is full of real life examples where people brought about change. The book does not claim that change is always easy and possible. If you want to change others you have to have a genuine reason and logic for that. Using this framework you cant make everyone change and make them to do anything. In most of our presentations we expect people to change or act in a manner we desire. When a salesman makes a presentation, he wants the buyer to say yes. When an entrepreneur make a presentation, he wants the investors to fund his business. In these situations, where we want to influence others, this book is of immense help. The only two things which is not so great about this book is the length. It is a bit long (around 300 pages) and it does become repetitious at times. This can be a problem if you understand the methodology the very first time. The authors keep revisiting the methodology so that no reader is left behind and the understanding is not compromised. But given that the content is so solid, one should manage around these issues and read (and use) the book in their lives. The book can be bought at $13.99 (Amazon Hardcover) or at Rs. 521 (flipkart paperback). It is available in Landmark stores in India at Rs. 599. Check out the book's website here. You can read the first chapter here for free (recommended if you have second thoughts about buying the book or not). Good recommendation. The Heath brothers go much deeper than others in this space when it comes to really explaining what makes ideas stick or convincing people to change. The reason Heath Brothers do a good job lies in their research. Made to Stick was an outcome of years of research and practice. Even Switch comes out as a well researched book which is simple to understand and implement. Thanks for this. I am glad you enjoyed it. I am waiting for the next review.